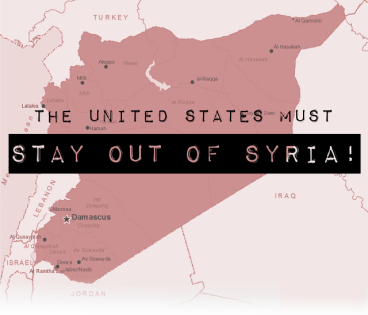 "TELL CONGRESS: STAY OUT OF SYRIA!" As a concerned American, I demand that all aid - lethal, non-lethal, and humanitarian - to the Syrian government or any of the rebel factions in opposition to the Syrian government be severed. I also demand that U.S. troops be removed from the Syrian arena. I urge each and every member of Congress and the Trump Administration to resolve to STAY OUT OF SYRIA and turn the United States away from former President Barack Obama's dangerous, unconstitutional foreign policy regarding their affairs. The fact is, segments of the Free Syrian Army have committed heinous crimes: they've sold the blood of martyred Christians, they've beheaded humans publicly, they've murdered members of their duly-elected government, etc. -- and it's an abomination to think that my tax dollars may have subsidized these horrific acts. Once again, I demand that all subsidies to any party in Syria from the United States be eliminated immediately. Furthermore, I demand that the United States' military presence be entirely removed from Syria. Troops have been committed to this conflict in the absence of a War Declaration, which means their presence in the region is entirely unauthorized and that they be brought home without delay. Enter your ZIP below to proceed to send personalized letters to your Representatives, Senators, and the Trump Administration - demand the US to STAY OUT OF SYRIA right now!